ARNEY P. STENSRUD Arney P. Stensrud of Minneapolis passed on September 11, 1955. Born in Sande, Norway in 1895, and was educated at Norwegian Naval Tech. He then came to this country where he learned to fly in 1913. 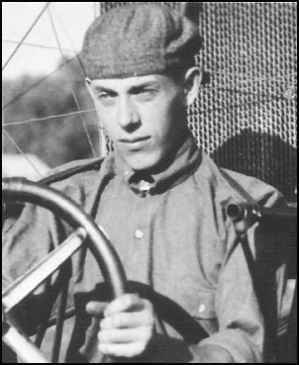 From 1913 to 1917 he was a barnstormer for Savage Brothers Aviation Company, and then joined the Kari-Keen Aircraft, Inc. of Sioux City, Iowa as factory manager. Since 1926 he had been with the Texas Company and was supervising engineer of the Minneapolis Division at the time of his passing. During World War I he was a member of the Aviation Section, Signal Corps, serving from 1917 to 1919. 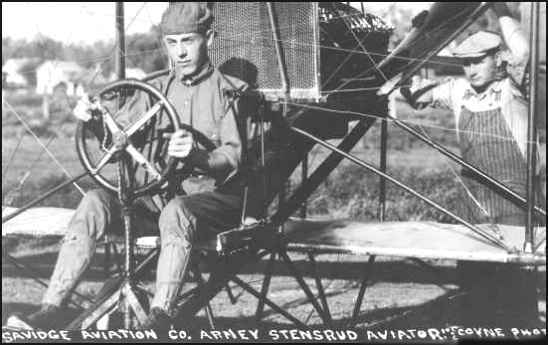 ONLINE RESOURCES If you search for "Arney P. Stensrud", using the Google search engine, (7-16-05), you will find two links, including one to this page. The other one, cited below, is very interesting. Gravestone Photo Project This page offers a very nice photograph of Arney's gravestone. It is located in the Wall Lake Cemetery, Sac County, Iowa. It was contributed on: 10/12/03 by: "cwoltrmn@netlic.net." You can access the page by clicking on the title above.